Raptivity - Rapid Interactivity Building Tool: Raptivity Establishes Its Prominence Once Again with An "Award of Excellence"
Raptivity Establishes Its Prominence Once Again with An "Award of Excellence"
Raptivity was recently recognized with an ‘Award of Excellence’ in the Best of Elearning! 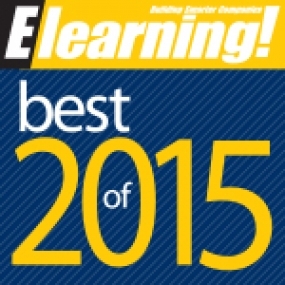 2015 awards, in the ‘eLearning Development Tool’ category. The votes sailed high through 4,000 nominations submitted by readers and professionals (Elearning! Magazine) across private and public sector. 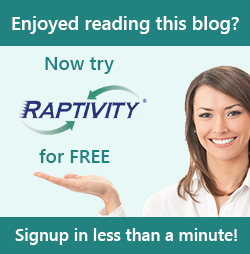 Team Raptivity is thankful to all its users across the globe who helped Raptivity earn this recognition. Raptivity as a development tool is backed with 190+ eLearning interactions incorporating HTML5/Flash technology, and spanning over diverse categories including exercises, diagrams, games, simulations, 3D objects, virtual world interactions videos and much more. With its free add on tool – Raptivity Linker, it also allows the users to thread together individual interactions for creating short learning experiences. Over the years, Raptivity has matured through the difference stages of product development cycle, sharpening all the edges to deliver easy content and course creation capabilities. We always knew that our users recognize Raptivity as the leader in the field of rapid interactivity. This recognition has indeed reinforced our leadership. Furthermore, it feels great to hold this stance for another year in the eLearning industry and we completely owe this win to you guys. These votes are a clear example of the high value impact that Raptivity has generated in the eLearning space, and we promise to only turn the experience better. A big thanks to all our customers once again for the unending support and confidence in us. And for now, its celebration time for all of us at Raptivity. Kudos to us, and all our supporters.